Using R-Drive Image, you can completely and rapidly restore your system after heavy data loss caused by an operating system crash, virus attack or hardware failure. R-Drive Image creates images on-the-fly, that is, without the need to restart Windows. Image files can be written to any storage places visible by the host system, including removable and network drives. R-Drive Image files can contain images of entire hard drives, individual partitions, and even several unrelated disk objects. Data in such files can be compressed, password-protected, commented, and split into several files. R-Drive Image uses volume snapshots to create consistent point-in-time disk images. Image files can be checked for errors to ensure full data integrity. This check can be performed for both already existing images and new images automatically after their creation. R-Drive Image restores images onto their original disks, new disks, any other partitions, or even on a hard drive's free space on the fly. Some partition management can be performed during image restorations: previous partitions can be deleted, new ones created, and the partitions to be restored can be resized. Images of entire hard drives can be restored to another drive with shrinking/expansion if necessary. 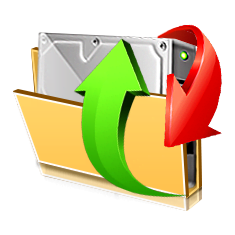 In addition to disk/partition restoration, R-Drive Image can restore individual files and folders from its image files. To restore system and other locked partitions, R-Drive Image can be booted into its startup version directly from Windows or by using a separate startup USB pen drive or CD/DVD. R-Drive Image can clone disks, that is, convert one disk into another by copying data from the source disk to the target one. Not only hard drives, it also can copy data from one or several partitions on one hard drive to another hard drive. Partitions can be shrunk/expand to match the size of a new HDD during this operation. This is an indispensable feature for entire system migration to another hard drive. Most disk backup tasks can be scheduled to run unattended at a certain amount of time. For example, you can have R-Drive Image automatically backup a corporate server during off hours. Moreover, such tasks can be very complex to create data consistent and space efficient backup sets. The built-in scheduler has a very versatile and flexible control over the time such task(s) are to be started. Action reports can be sent via e-mail and external programs can be launched upon completion of every task. In addition to scheduled time, every task can be started manually. Complex scripts can be created for frequently repeated unattended disk actions. Those scripts can be executed from a command line or included into command files. Scripting is supported for creating a new image file, appending data to an existing one, restoring data from an image, checking an image, and connecting/disconnecting images as virtual logical disks. Scripts can be created manually or from the R-Drive Image user interface. The startup version of R-Drive Image performs all disk actions the Windows version does except for scheduled actions and scripts, but primarily it is used to restore data to system disks and other locked disks, and to service non-Windows machines. It supports UEFI startup (including Mac computers), wide variety of hardware devices (view the list), and data transfer over Microsoft network (the CIFS protocol). The startup version can be created directly from the Windows version and fits into a small USB pen drive or a CD/DVD. R-Drive Image supports FAT/exFAT, NTFS, ReFS / ReFS2+ (Resilient File System, Windows 2012/2016 Server), HFS/HFS+, Little and Big Endian variants of UFS1/UFS2 (FreeBSD/OpenBSD/NetBSD/Solaris), and Ext2/Ext3/Ext4 FS (Linux). It can resize NTFS, FAT, HFS/HFS+ partitions. R-Drive Image can perform raw data imaging/copying/restoring for disks with unrecognizable file systems. Full support for the Basic(MBR) and GPT partitioning layouts. R-Drive Image can create Basic/GPT disks, resize them, and change their partition layout during copy/restore operations. Support for automatic resizing for dynamic disks. R-Drive Image can connect its image files as read-only virtual drives. Windows and and Windows programs can access files on such drives as if they resided on physical read-only storage devices. Simple wizard interface. Almost all actions can be specified by several mouse clicks, no in-depth computer management skills are required. Support for S.M.A.R.T. warnings. If a hard drive has a risk of a possible hardware failure, its S.M.A.R.T. (Self-Monitoring, Analysis and Reporting Technology) system throws special warnings. R-Drive Image displays such warnings and includes them into its confirmation e-mails. Mass system deployment: R-Drive Image can be used to set up many identical computers. Once one computer is fully set up, its disk image can be created and then deployed to all other computers to reduce time and costs. System Recovery Media Creator: R-Drive Image can create special System Recovery OEM media device, that is, startup disk(s) that may be used to restore a computer system after a complete failure when it requires a complete fresh setup (system recovery disks). It may be a CD, DVD, USB, ZIP drive or any other removable media device.